According to the American Cancer Society, approximately 3,000 people are diagnosed with mesothelioma in the United States each year. Mesothelioma is a form of cancer that begins in the tissues, known as the mesothelium, that line the lungs, stomach, heart, and other organs. While there are different forms of mesothelioma, there are some things that are true for all forms of the disease. It's almost always caused by asbestos exposure decades prior to diagnosis; it's difficult to treat; and patients have the right to explore their legal options. Pleural mesothelioma. This is the most common form of mesothelioma. It develops in the lining surrounding the lungs. Pleural mesothelioma may develop 20 to 50 years after asbestos exposure. Symptoms of this type of cancer include shortness of breath, persistent cough, fluid around the lungs, hoarseness, difficulty swallowing, chest pain, and lower back pain. Peritoneal mesothelioma. This type of mesothelioma develops in the lining of the abdomen, called the peritoneum. It can be caused by the inhalation or ingestion of asbestos fibers. Symptoms of peritoneal mesothelioma may include abdominal pain, constipation, diarrhea, night sweats, fever, weight loss, fatigue, nausea, and vomiting. Pericardial mesothelioma. Pericardial mesothelioma develops in the pericardium, which is the lining surrounding the heart. The pericardium is thin and the tumors may grow into the heart and spread to other parts of the body. Asbestos is the only known cause of this type of cancer. 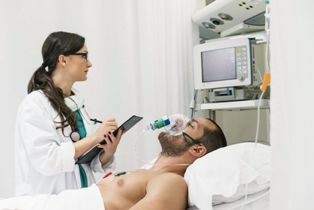 Symptoms of pericardial mesothelioma may include chest pain, difficulty breathing, cough, fever, heart palpitations or irregular heartbeat, heart murmurs, fatigue and night sweats. If you experience symptoms of mesothelioma, then your doctor may suggest medical tests so that an accurate diagnosis can be made. These tests may include medical imaging tests such as X-rays, CT scans and PET scans, blood tests to look for proteins that would be consistent with mesothelioma, and biopsies to confirm the diagnosis and identify the specific type of cancer in your body so that a treatment plan can be developed. The stage of the cancer at the time of diagnosis. Whether or not the tumor is operable and removable. Whether or not the patient is suffering from any other disease or illnesses. The treatment that a patient receives. The form of mesothelioma from which the patient is suffering. Early detection of mesothelioma is a key part of improving chances of survival. Thus, if you may have been exposed to asbestos and you experience any symptoms of mesothelioma then it is important to talk to your doctor as soon as possible. Surgery. Surgery may be recommended to remove mesothelioma from your body or to alleviate your symptoms. For example, cytoreductive surgery or removing an entire lung may be recommended to eliminate or reduce the cancer in your body. If this is not possible, then surgery to remove fluid from your lungs or other surgeries to manage your symptoms may be recommended. Chemotherapy. Chemotherapy kills cancer cells. It may be used to shrink tumors or to kill any cancer cells that are not surgically removed. Radiation. Like chemotherapy, targeted radiation treatments may be used to kill cancer cells. Radiation can also be used to manage pain by reducing the size of mesothelioma tumors. Complementary treatments. Alternative treatments may help you control your pain and manage your symptoms. These treatments could include acupuncture, aromatherapy, craniosacral therapy, therapeutic touch therapy, homeopathy, massage, meditation, and cannabis. Experimental treatments. Researchers are working on new treatments to treat mesothelioma. You may qualify for a clinical study or be able to receive experimental treatment. Some of the experimental treatments that are being tried include gene therapy, immunotherapy, photodynamic therapy, virus therapy, targeted therapy, and new chemotherapy medications. More than one of these treatments may be useful for you. All treatment options should be discussed with your doctor who can make individualized recommendations that are in your best interests. Treating mesothelioma is very expensive. While the exact expenses vary from patient to patient, you may face significant medical costs, the need for in-home healthcare, lost wages, and other financial and emotional losses. Mesothelioma is not known to be a cancer that develops without an external cause. If you developed mesothelioma because of asbestos exposure then you may have a legal claim against your past employer or another negligent party and you may be able to recover the compensation that you need and that you deserve. Financial compensation can help you to live with your mesothelioma more comfortably, and provide you with the resources you need to explore all relevant treatment options. In the event that you have recently lost a loved one to mesothelioma, a lawsuit can help you to recover compensation for the decedent’s lost wages, medical expenses, funeral and burial expense, and loss of guidance, consortium, and companionship. Being diagnosed with mesothelioma can be scary and emotional. This devastating news can be very traumatic to deal with, and the treatment process can be painful, exhausting, and expensive. Let us help you through this difficult time. We would be pleased to meet with you for a free, no-obligation consultation and to work for you on a contingency fee basis. That means that you won’t pay any up-front legal fees for our services and instead, your legal fees will only be paid as a percentage of any settlement that we recover for you. Call us today or reach out to us via this website to learn more.